For this week’s edition of the Best Of Worthing Court, let’s get down to nitty gritty, shall we? Here’s what I mean…it’s fine to look at all those pretty spaces, but sometimes you need to know exactly how to achieve the same look – right? 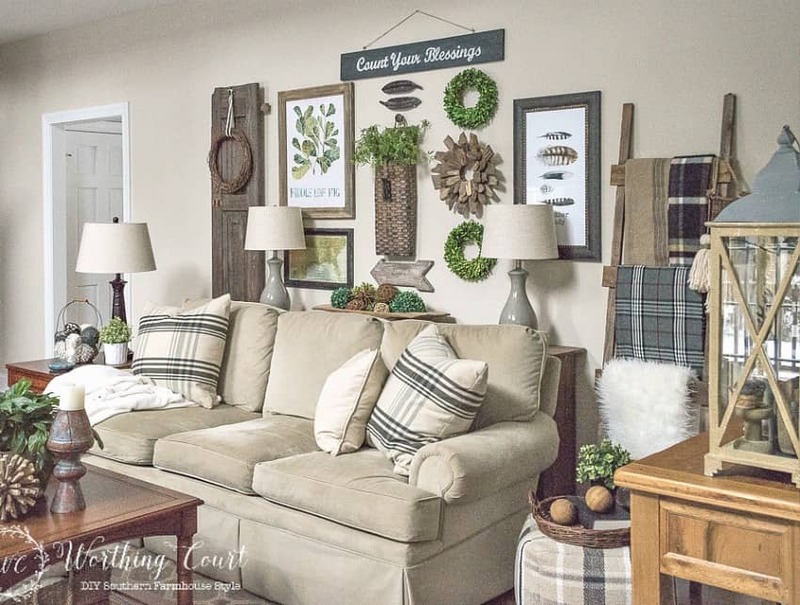 For example, take the gallery wall above the sofa in my family room. This was my second attempt at creating a gallery wall and it was not good. My first attempt was in the basement of our former home. It wasn’t that hard because I had a picture out of a Pottery Barn catalog to inspire me. (You can take a look at that wall HERE, if you’d like to.) But…I was winging this gallery wall totally on my own. What I came up with was too narrow, I didn’t like the proportions of some of the items and it lacked personality to me. You can click HERE to see how the gallery first looked. I decided that I needed something to spread it out and I didn’t want to do that by hanging more small stuff on the wall. 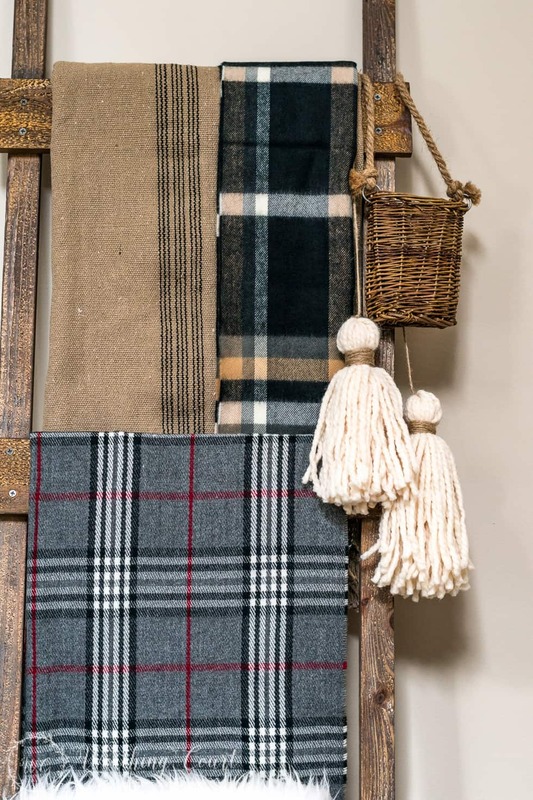 So….I came up with the idea to hang a large antique shutter on one end and to add a blanket ladder on the other. In addition to expanding the width of the gallery, I thought that having two larger, longer items on the ends would help to frame out the gallery and give it definition. 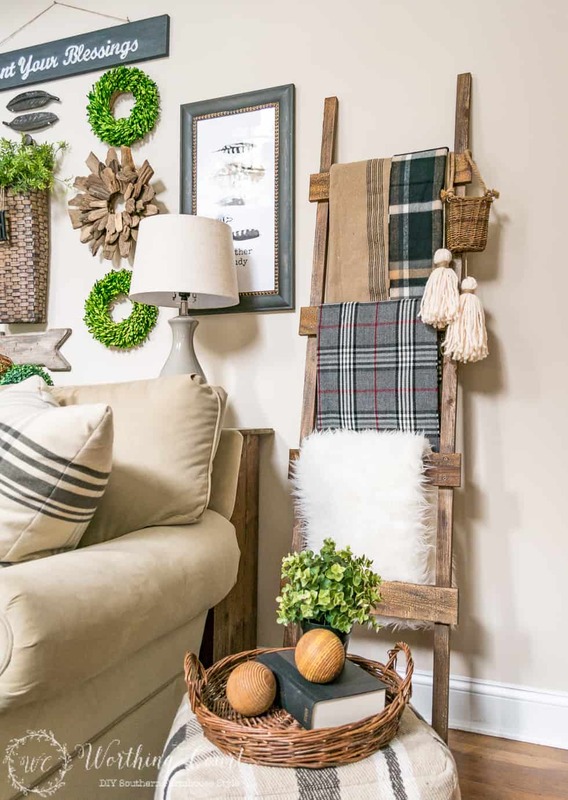 I especially loved the idea of a blanket ladder because I knew that I could switch it up for the different seasons and holidays. Not only is this project super affordable, it’s totally easy! I’ve wanted a ladder for a loooong time, but those bad boys cost way more than I was willing to pay. The price of authentic wood ladders has skyrocketed. Pottery Barn has a nice ladder, but no way am I going to pay $250 for something that I could easily knockoff myself. I made mine for under $20, not including the cost of paint and stain because I already had those on hand. 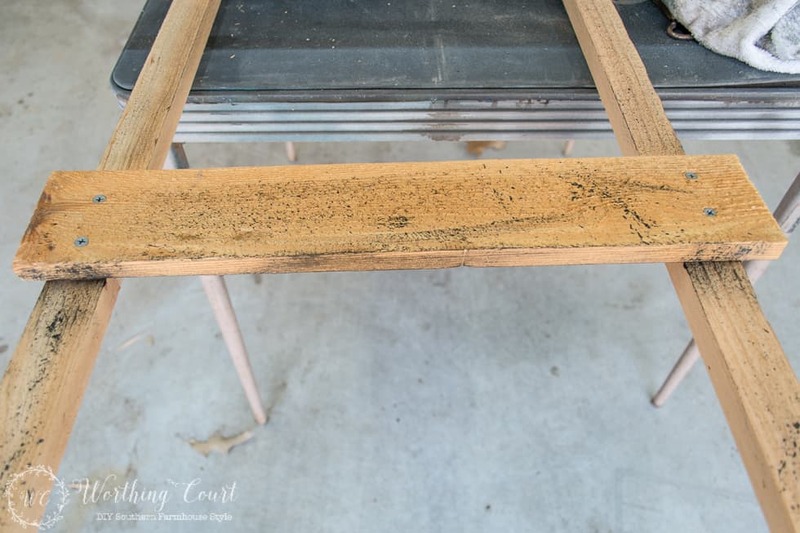 I think you’ll find this is a super easy project that you could make in an afternoon (depending upon drying time for the paint & stain). 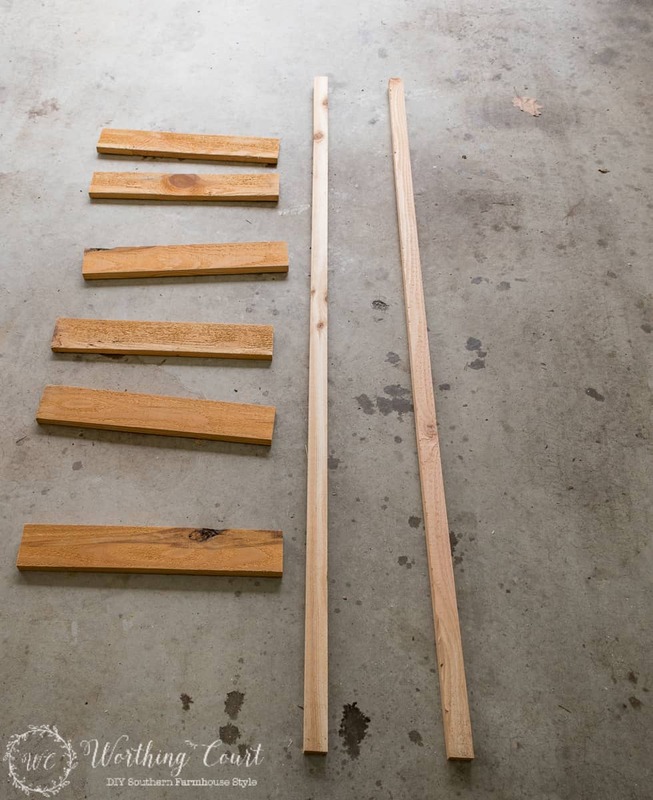 Below are the supplies that you’ll need to make a 6′ tall, 18″ wide ladder with four rungs. Of course, you can adjust the amount of lumber you need based on the size ladder that you want to make. 2 – 1x2x8 boards – I used cedar instead of pine boards. The cedar boards are rough on one side, which contributes to the rustic look. 1 – 1x4x8 board – Again, I used cedar. I cut each of the 1x2x8 boards to 72″ long (these will be the sides) and the 1x4x8 board into 18″ long pieces (these will become the rungs). There are six pieces of 1x4x8 in the below photo, but I wound up only using four of them on the ladder. Lay the 1x2x8 boards side by side, at 16″ apart, making sure that the top and bottom of the boards lines up. If you’re using cedar boards, turn them rough side up before assembly. 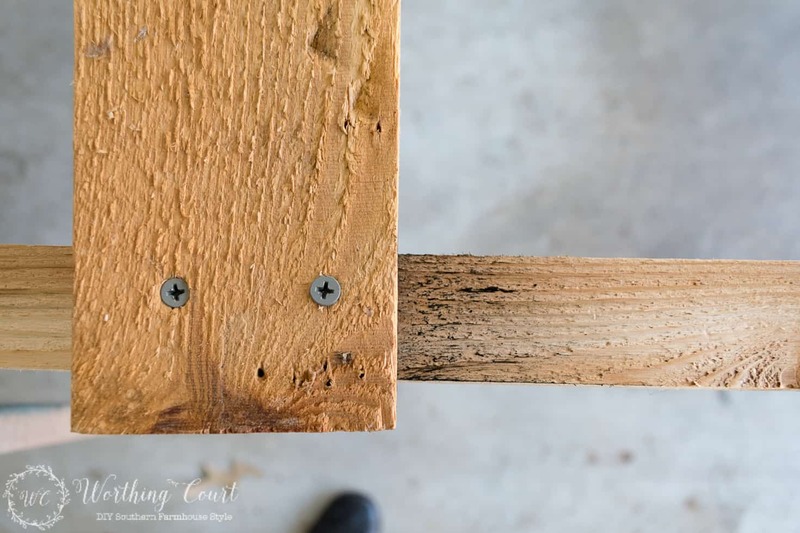 Determine the location of each rung and attach the rung to each side board using two wood screws. When attaching the rungs, allow them to hang over the side boards by 1″ on each size. This will give you an 18″ wide ladder. Make sure they’re level from side to side or your ladder will wind up being wonky. All assembled and ready for finishing. You can see that I didn’t get my rungs spaced evenly apart. 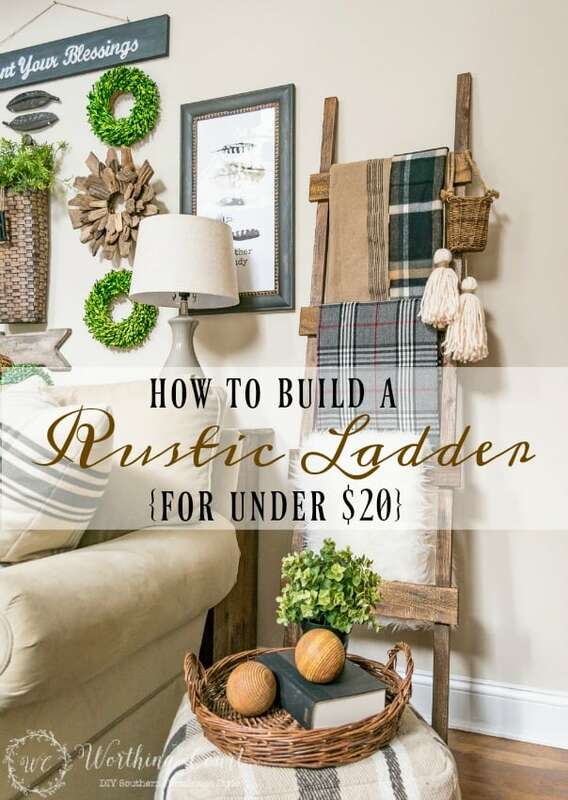 That’s ok – this is rustic ladder, remember? To finish the ladder, I used black latex paint (that was leftover from painting the handrails in my foyer), Rust-Oleum Weathered Gray Wood stain and Minwax Wood Finish stain in Special Walnut (leftover from refinishing our floors). …then wipe most of the paint off on a rag. Start out with less paint that you think you’ll need because you can always add more. What do I mean by strategic painting? 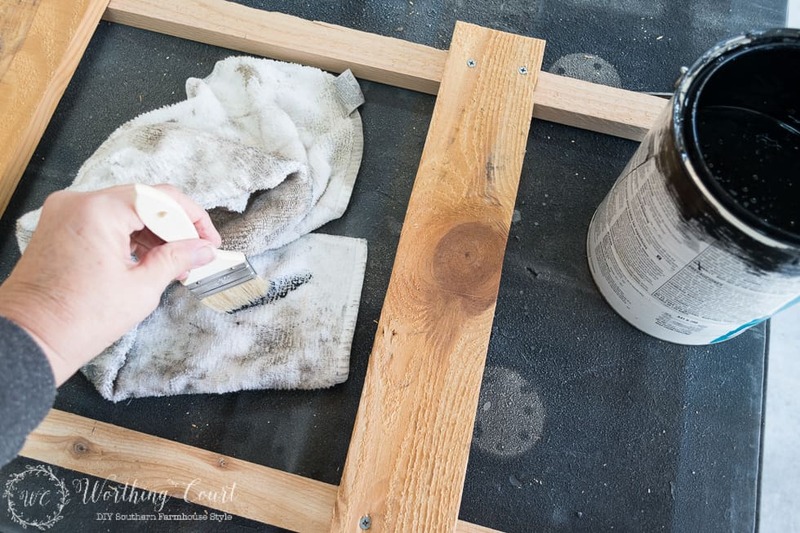 Well, I knew that I wanted my ladder to look old – kind of like it had been sitting in someone’s barn accumulating dirt and grime for years. 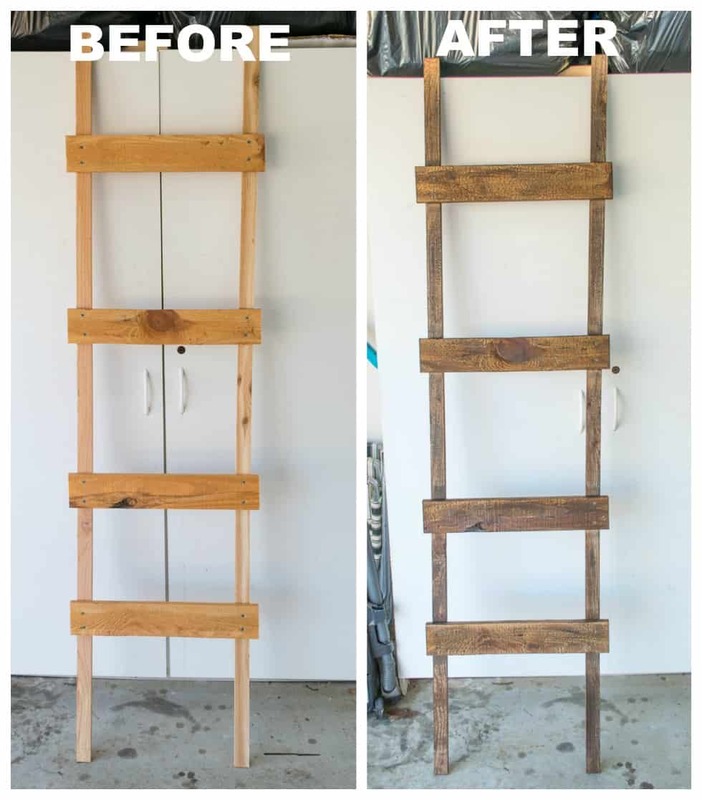 I thought about where an old ladder like that would have accumulated the most gunk and look the dirtiest. I decided that it would be at the top of each rung, where they are attached to the sides, and along the edges of every board. So, I started off lightly dry-brushing black across the surface of each board. Then I brushed it along the edges of each board, using slightly firmer pressure. After dry-brushing, I added a little more paint to my brush and used my finger to flick some black spots onto the boards. Think about those dark spots (mildew, I guess?) that you see on old, old boards. Lastly, I started working some of the black paint into the areas where each rung was attached to the sides. Remember, I want the ladder to look like it has been accumulating gunk for a long time. 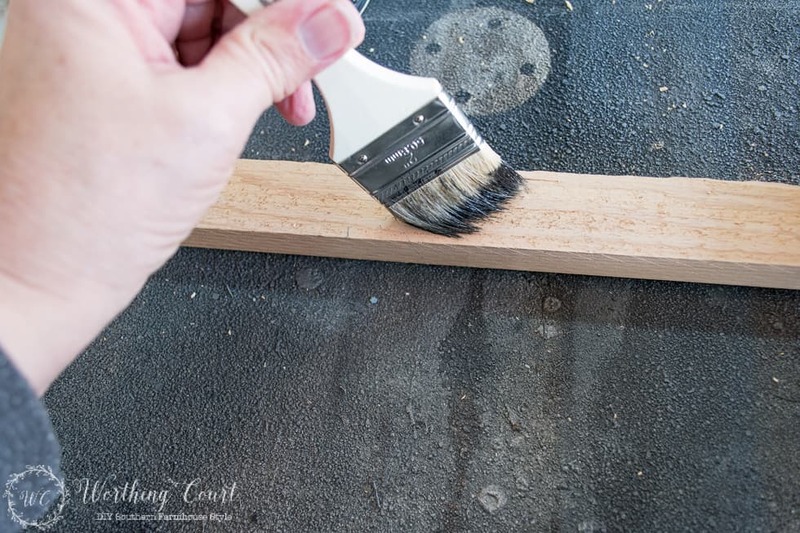 Allow the black paint to dry and then apply the gray stain, using the same dry-brush method. Once the gray stain has dried, apply the wood colored stain. 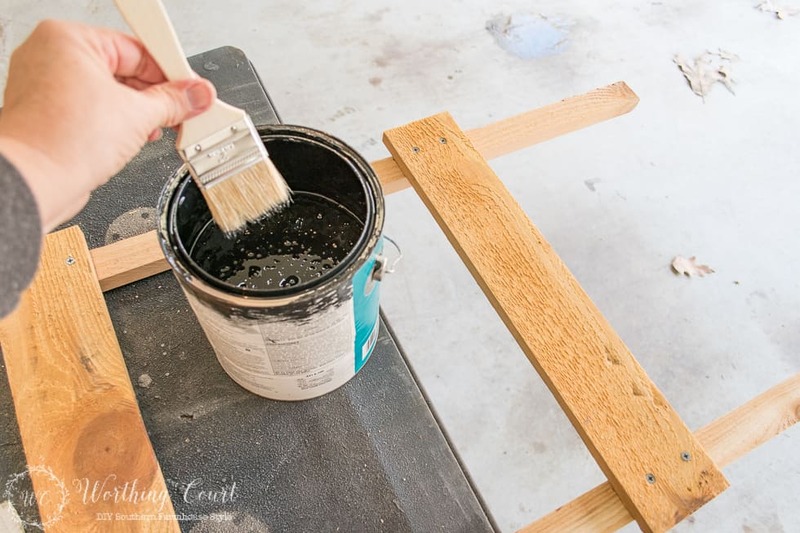 Make sure you apply the paint and stain to every surface – the front, the sides and the back of the ladder. Sorry, no pics of these steps! Here she is all finished. See the difference? What do you think – does it look old now? After leaving the ladder out in my workshop (aka the garage) for a few days to get rid of the stain odor, she was ready to come inside to be dressed! I filled her up with throws and a couple of scarves and draped a couple of diy chunky tassels over the top rung. I added the little hanging basket, just for good measure. 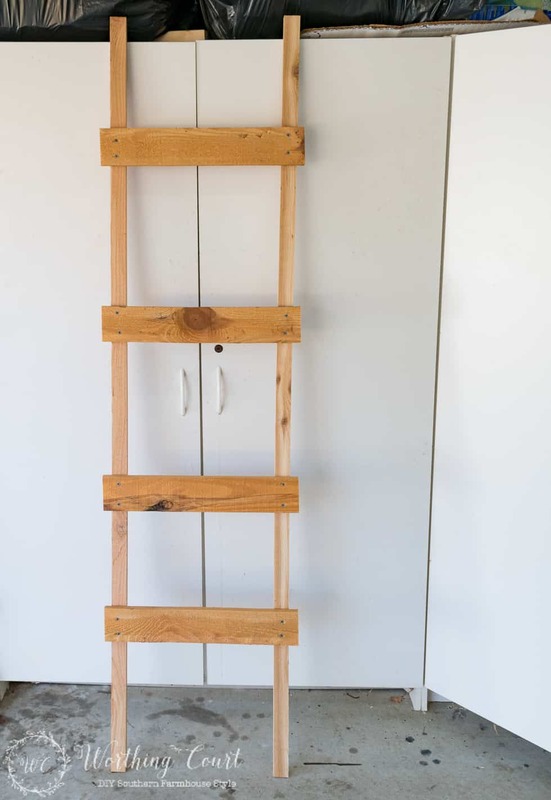 Several of you asked how I made my ladder, so I hope this tutorial helps. As always, let me know if you have any questions! Thanks for sharing how to make new wood look old!!!!! Now, I can use that method on other projects. AND, your gallery wall looks great!!!! I love it! I love making things if possible instead of buying. Thanks for the wonderful ladder project. I like the ladder project and I will definitely pin this. Great project! One question…I have little ones in the house a lot, how do you attach it to the wall so it won’t fall on the little darlings if they bump it? 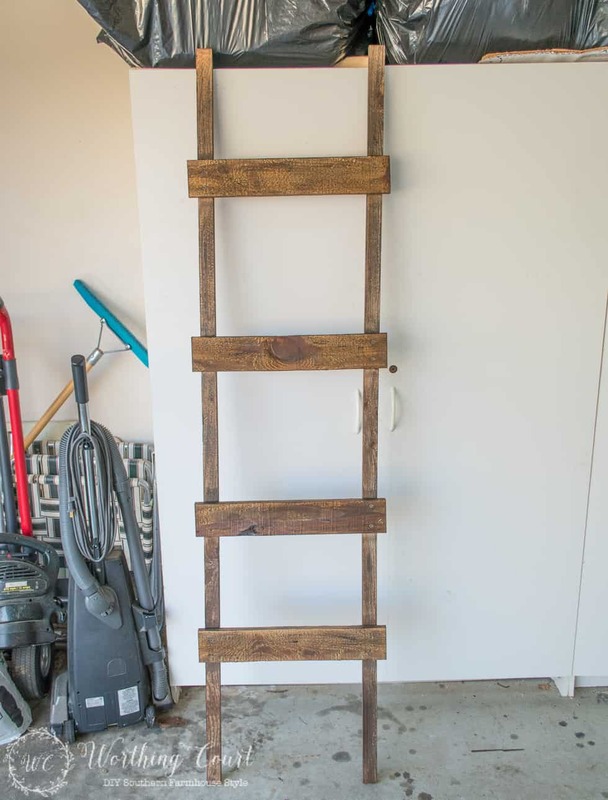 Thanks for sharing how to make this great ladder! Love your gallery wall. The ladder and shutter really pull the look together. I’m in the process of trying to put a gallery wall together for over my TV and it’s not an easy task. 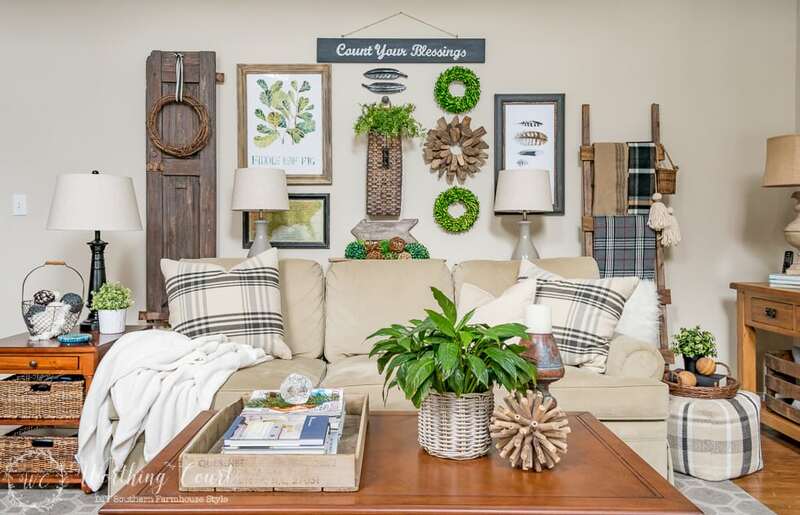 I loe how you have put an amazing wall together, my favorite is the ladder , very clever, and so glad you stopped by Oh My Heartsie GIrls WW this week to share, I appreciate it and I am sure that our other visitors will too! I have pinned and Tweeted. Love this! Going to have to try and make one myself. Thanks for the tutorial.